The Book V on churches was essentially written in Italy, before Serlio arrived in France in 1541. As early as 1537 Serlio indicated its contents in the list of the seven books of his treatise at the beginning of Book IV on the orders, published in Venice by Francesco Marcolini (“nel quinto diro’de molti modi di tempi disegnati in diverse forme”, f. V). But unable to find a publisher in Venice, Serlio had to wait until 1547 to be published, a few months before the death of his patron Francis I. The work is dedicated to Queen Marguerite de Navarre, the king’s sister, who granted him an annual sum. In the “Avertissement aux lecteurs” which concludes Books I and II devoted to geometry and perspective, published in Paris in 1545 (f. 74), Serlio announces that the book on churches would be published very soon. Like the first two books, Book V is bilingual and was translated by Jean Martin. The French text is printed in large Roman type and the Italian text in large italics. It contains thirty-four leaves (including the title page) and twenty-nine illustrations, thirteen of which are full page. Each church is illustrated by a plan, a section or a view in perspective and by an exterior elevation. The book exists in two forms, published by Michel de Vascosan and for the most part printed by his brother-in-law, Conrad Bade, with whom he shared this edition (Vène 2007). Only a few copies bear the note “De l’imprimerie de Conrad Badius” on the title page. The work consists of twelve church projects, nine with a centered plan and three with a longitudinal plan. The projects proceed according to a geometric hierarchy. Among the nine centered plans, two are circular, one oval, one square, one pentagonal, one hexagonal, one octagonal and two shaped like the Greek cross. Serlio, influenced by Book VII of Leon Battista Alberti’s De re ædificatoria, uses the word “temple” to mean “church” and favors churches with centered plans which make allusion to the temples of classical antiquity (Wittkower 1965). In fact several of the churches resemble tombs and antique temples which Serlio illustrated in his Book III on antiquities. Although in 1534 in Venise, the man from Bologna (along with Titian and Fortunio Spira) was part of the committee charged with reflecting on Francesco Zorzi’s “memoriale”, of neo-Platonic inspiration, concerning the proportions of the church San Francisco della Vigna, he did not use harmonic proportions in the churches of Book V (Zampa 1989). All the churches of this book are projects, or they are inspired by churches imagined by Leonardo da Vinci, Giuliano da Sangallo, Baldassare Peruzzi and Antonio da Sangallo the Younger, even those of a longitudinal plan (Bruschi 1989). Moreover, in Terzo libro Serlio illustrates the projects of Bramante and Raphael for Saint Peter’s Basilica in Rome, Raphael’s a longitudinal plan and Bramante’s a centered plan. In the description of the first project (f. 3) and in that of the twelfth project (f. 30v°), Serlio says that he is presenting projects of modest-sized churches whose construction can be completed ; in fact many large-scale churches remained unfinished during his period, for lack of money or for religious reasons. This is the case for the cathedrals in Milan and Florence, Saint Peter’s Basilica in Rome, San Petronio in Bologna, but also Saint-Eustache in Paris, which, begun in 1532, was in the midst of being built during Serlio’s stay. He had actually participated in the 1525 competition to complete San Petronio. I think that the plan for the eleventh project (f. 30) is a variation on the drawing of the plan that he had anticipated using for Bologna, carried out with Peruzzi. One must point out that in connection with the twelfth project, Serlio mentions numerous European Gothic churches: “Many differings inventions can be made for thid oblong temples in the form of a cross. Chistendom is full of these temples, particularly modern ones, wich in Italy (by the majority opinion) are called German work” (f. 30v°). The Gothic style is described by the words “opera Thodesca” (“ouvrages Tudesques ou d’Allemands” in the French text) and “moderni” (“modern”). Serlio was certainly thinking about the cathedrals in Milan and Florence as well as San Petronio church in Bologna. Raphael had already used the expression “opera tedesca” in that sense in his Letter to Pope Leo X, written between 1519 and 1520, as had Giorgio Vasari in Le vite, published in 1550 and 1565. Serlio specifies that the French Gothic churches often had five naves, alluding not only to Notre-Dame de Paris, but also to Saint-Eustache whose plan was inspired by that of the cathedral. This is the only comment made by Serlio in Book V on French religious architecture. The plan of the twelfth project (f. 31v°) is maybe the model for the church Saint-Éloi des Orfèvres in Paris, built by masons François de la Flasche and Jean Marchant between 1550 and 1551 (Frommel 1998). M. Tafuri and M. Carpo have suggested that in the dedication one see expressions of sympathy for Protestantism on the part of Serlio and Marguerite de Navarre, because of Saint Paul’s letter to the Corinthians, dear to Protestants: “Even though true temples are the hearts of devout Christians in which, by faith, Jesus Christ our Saviour lives” (f. 1). Marguerite de Navarre was advocating instead a revitalization of the Catholic Church in France through the influence of humanist philosophical ideas (Fontaine 2004). 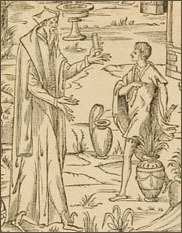 Although the Extraordinario libro was published in Lyon by Jean de Tournes, nothing proves that, like his publisher, Serlio was a practicing Protestant. With his Venetian friends, Pietro Aretino, Jacopo Sansovino and Lorenzo Lotto, he wanted only a reform of the Catholic Church, just as Marguerite de Navarre did. Besides, D. Thompson (1995, p. 248) has shown very well that the projects of Book V were not used as models for the first Protestant churches constructed in France after the Edict of Nantes (1598); although most have a centered plan, they have interior galleries which are never found in Serlio’s projects. Nevertheless Serlio’s Book V had a definite influence on the collection of the Petits temples (1550) by Jacques Androuet du Cerceau. This collection contains not only projects for churches but also a series of projects for châteaux copied by du Cerceau from the handwritten version of Serlio’s Book VI devoted to civil architecture, at Columbia University (New York), with his own annotations. In addition, A. Bruschi has shown the influence of several projects from Book V on the churches of Vignola in Italy. A. Bruschi, "Le chiese del Serlio", C. Thoenes (ed. ), Sebastiano Serlio, Milan, Electa, 1989, pp. 169-186. M. Carpo, La maschera e il modello. Teoria architettonica ed evangelismo nell’Extraordinario Libro di Sebastiano Serlio, Milan, Jaca Book, 1993, pp. 53, 85-105. M. Carpo, "Jean Martin traducteur de Serlio 1545-1547", S. Deswarte-Rosa (ed. ), Sebastiano Serlio à Lyon. Architecture et imprimerie, Lyon, Mémoire active, 2004, pp. 131-132. T. Carunchio, "I projetti serliani per edifici religiosi”, Bollettino del Centro Internazionale di Studi di Architettura Andrea Palladio, 19, 1977, pp. 179-189. M.-M. Fontaine, "Serlio et l’entourage de Marguerite de Navarre", S. Deswarte-Rosa (ed. ), Sebastiano Serlio à Lyon. Architecture et imprimerie, Lyon, Mémoire active, 2004, pp. 105-108, 112-118. S. Frommel, Sebastiano Serlio architect, Milan, Electa, 1998, pp. 289-301. M. N. Rosenfeld, "From Drawn to Printed Model Book: Jacques Androuet Du Cerceau and the Transmission of Ideas from Designer to Patron, Master Mason and Architect in the Renaissance", RACAR, 16-2, 1989, pp. 135-144. A-M. Sankovitch, "Le Quinto Libro traduit par Jean Martin", S. Deswarte-Rosa (ed. ), Sebastiano Serlio à Lyon. Architecture et imprimerie, Lyon, Mémoire active, 2004, pp. 137-141. M. Tafuri, "Vos enim estis templum dei vivi. Inquietudini religiose ed architettura fra Venezia e la corte di Margherita du Navarre", Venezia e il Rinascimento, Turin, Einaudi, 1985, pp. 79-124. M. Tafuri, "Ipotesi sulla religiosità di Sebastiano Serlio", C. Thoenes (ed. ), Sebastiano Serlio, Milan, Electa, 1989, pp. 57-66. D. Thomson, "Protestant Temples in France c. 1566-1623. A pilot study", J. Guillaume (ed. ), L’église dans l'architecture de la Renaissance, Paris, Picard, 1995, pp. 245-256. R. Tuttle, "Sebastiano Serlio bolognese", C. Thoenes (ed. ), Sebastiano Serlio, Milan, Electa, 1989, fig. 3, p. 22, Fabbriceria di San Petronio, n° 15a. M. Vène, Bibliographia serliana. Catalogue des éditions imprimées des livres du traité d'architecture de Sebastiano Serlio (1537-1681), Paris, Picard, 2007, pp. 23-27, 71-72. R. Wittkower, Architectural Principles in the Age of Humanism, New York, Random House, 1965, pp. 18-19 (1st ed. : Londres, 1949). P. Zampa, "Proporzione ed ordine nelle chiese di Serlio", C. Thoenes (ed. ), Sebastiano Serlio, Milan, Electa, 1989, pp. 187-189.